Read the Background section of this module for more information about drugs in the news. Provide students with the Module 6 magazine Drugs in the News for background knowledge. Photocopy and pass out the Drugs in the News Fact Sheet for students to complete during the lecture. Before giving students time to review the magazine, begin with the following activity. Lead a discussion about drugs in the news and other media outlets. Ask students what they’ve read and seen in the media about substance use and addiction. Specifically mention the drugs included in this module and see whether students are familiar with these three substances. List students’ responses on the chalkboard. Reading: Give students adequate time to read the student magazine. Have them pay particular attention to the following sections: Background, Stats and Facts, and Science in the Spotlight. Discussion: In small groups, have students discuss the information using the following questions. Then, bring the groups together and discuss as a class. Review the effects of the drugs, how the drugs are used, how the drugs act in the brain, and why these drugs appear so often in the media. 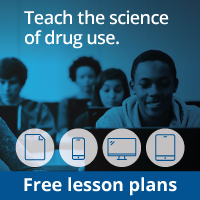 Tell students that one goal of this lesson is to help them learn how individuals, families, and the community are affected by drugs of abuse. A second goal is to give students the skills to critically analyze how the media covers information about drugs of abuse. Why are these drugs illegal? What parts of the brain are affected by steroids? Methamphetamine? Other club drugs? What are the risks to an individual who may use these drugs? What is the impact of these drugs on communities? Why do these drugs appear so often in the media? Is the media coverage of drugs balanced? Have students seen both positive and negative information presented when drugs are discussed?